Forming Atlantic Records, signing Ray Charles as one of its first artists. "I think it’s better to burn out than to fade away… it’s better to live out your days being very, very active — even if it destroys you — than to quietly… disappear…." Born in Istanbul, Turkey. Son of Turkish diplomat Mehmet Munir Ertegun and Hayrunisa Rustem. Raised at embassies in Switzerland, France and England. Older brother Nesuhi takes Ertegun to see Cab Calloway and Duke Ellington at the Palladium in London. 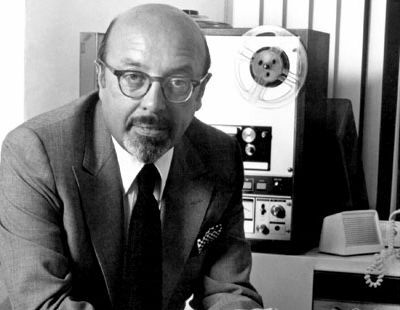 Moves with family to Washington, D.C., when his father becomes Turkish ambassador to the U.S.
At age 14, Ertegun’s mother buys him a record cutting machine. Taking a Cootie Williams instrumental, “West End Blues,” he writes lyrics to it. With the instrumental playing on a record player he sings lyrics into the microphone as the record plays. Graduates from St. John’s College in Annapolis, MD. Goes on to graduate studies in philosophy at Georgetown University in Washington, D.C.
Father dies, is buried at Arlington National Cemetery and, in 1946, his remains are transported back to Turkey on the USS Missouri. Co-founds Atlantic Records in New York City with friend and jazz fan Herb Abramson (a dental student and A&R man for National Records) and a $10,000 loan from Ertegun’s family dentist. They pick the name after hearing of a label called Pacific Jazz. Atlantic’s first office is in the condemned Jefferson Hotel on 56th Street between Sixth Avenue and Broadway. The living room is used as the office. Travels to New Orleans to scout Professor Longhair, which convinces the label to incorporate New Orleans sound in recordings. The more sophisticated and jazz-oriented session men are unable to recreate the precise sound, but in the process create the “Atlantic Sound,” which supports all the label’s singers with boogie-based, sax-lead band arrangements that are an internal part of the song. “Drinkin’ Wine Spo-Dee-O-Dee” by Stick McGhee is Atlantic’s first major hit record. Signs and produces Ray Charles, Professor Longhair, the Clovers, Big Joe Turner, Ruth Brown, LaVern Baker, the Drifters, and many others. Atlantic becomes the country’s preeminent R&B label. Jerry Wexler joins Atlantic as a partner, paying $2063.25 for a 13 percent share. Ray Charles records a song that marks a stylistic departure, “Mess Around,” written by Ertegun under the name Nugetre. Atlantic offers Colonel Tom Parker $25,000 for Elvis Presley’s contract but loses out to RCA. Nesuhi Ertegun joins Atlantic. He initially develops Atlantic’s album department and builds up the label’s extensive jazz catalog, producing John Coltrane, Charles Mingus, Ornette Coleman, and the Modern Jazz Quartet. Darin earns two Grammy Awards, Atlantic’s first. Marries Ioana Maria Banu. Known as Mica, she becomes a prominent interior designer. Ertegun moves Atlantic further into pop world by signing Sonny & Cher. Atlantic dominates soul music revolution with Aretha Franklin, Otis Redding, Solomon Burke, Wilson Pickett, Percy Sledge, Booker T. and the MG’s, Sam and Dave, Clarence Carter, King Curtis, and many others. Ushers in groundbreaking period in history of white rock and roll, signing Buffalo Springfield, Eric Clapton & Cream, The Rascals, The Bee Gees, Led Zeppelin, Yes, Crosby Stills & Nash (and sometimes Young), and Blind Faith before the decade is out. 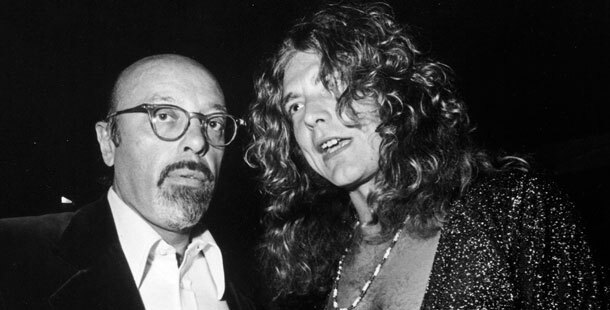 Ertegun and Atlantic partners sell label to Warner-Seven Arts. Ertegun retains creative control. Wexler signs Led Zeppelin (consisting of ex-Yardbird and session mainstay Jimmy Page, Robert Plant, John Bonham and John Paul Jones) to Atlantic. Signs the Rolling Stones, an association that lasts 14 years. Co-founds Cosmos soccer team in New York and serves as president of the club. Elevated from president to become first chairman/CEO of Atlantic. With Jann Wenner, co-founds Rock and Roll Hall of Fame Foundation. Named chairman. Inducted into Rock and Roll Hall of Fame. Receives Honorary Doctorate from Berklee College of Music. Receives Trustees Award from National Academy of Recording Arts & Sciences. Alaska-born vocalist Jewel releases her first Atlantic album, Pieces of You. Atlantic releases an album with Jose Carreras, Placido Domingo and Luciano Pavarotti: The Three Tenors in Concert 1994. Main exhibition hall at new Rock and Roll Hall of Fame and Museum in Cleveland is named for Ahmet Ertegun. Kid Rock debuts on Top Dog/Lava/Atlantic with Devil Without a Cause. Honored as a “Living Legend” by United States Library of Congress. Inducted into National Soccer Hall of Fame. Ertegun and wife Mica donate gift to establish Ertegun Jazz Hall of Fame at Jazz at Lincoln Center, in honor of Ahmet’s brother Nesuhi. Named founding chairman of Atlantic Records. Receives President’s Merit Award from National Academy of Recording Arts & Sciences. Honored with opening night concert at 40th Montreux Jazz Festival. Dies in New York City at age 83.